A centre speaker has a challenging part to play. It has to be a soloist—delivering clear and natural dialogue across a broad soundstage. A split second later, it has to fill the role of back-up band—melding with the ambiance of the environment to contribute realism in movies and music. The Prime Centre delivers on both of these demands with world-class precision via its 1” aluminum dome tweeter, dedicated and independently sealed 3.5” midrange driver and dual 5.25” woofers – a true three-way design that is a rarity for centre channel speakers in their price class. Voicing is neutral and natural, bringing dialogue and vocals forward just enough to be clear and intelligible. Yet, when called on to play its part in transitions—like a jet fighter soaring across the sky from left rear channel to front right—it blends in to create a smooth, realistic transition. Elegantly styled like its Prime siblings, the Centre will look beautiful in any listening environment. Borrowing liberally from the flagship Ultra Centre, the Prime Centre channel features a true 3-way centre channel with a vertically-aligned tweeter and midrange driver. This eliminates comb filtering and lobing in the horizontal axis – resulting in crystal clear dialogue at all listening positions in the room. Now everyone will have a ‘sweet spot’ and won’t have to strain to hear dialogue. 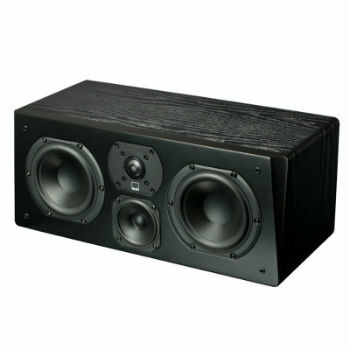 Available in premium-grade piano gloss black or handsome black ash finish, the Prime Centre is handsomely styled and tells the world you’re serious about high performance home theatre.